I chose to learn American Sign Language for a number of reasons. As an educator, American Sign Language will help me communicate with colleagues, parents and students who may be deaf or hard of hearing. My partner also has family members who are deaf, and I wanted to be able to fully communicate with them. I also work in the service industry, and want to be able to accommodate any customer I might encounter to the best of my ability. Simply put, I want to open my lines of communication and be as inclusive as possible as a person communicating in a world with others. When I began the ASL learning project, I set out to use lifeprint.com, and complete lessons 1-15. Lets all take a minute to stop and laugh. I had no idea how difficult it would be to learn American Sign Language in six weeks, and in setting that goal not only did I overestimate my ability, but I underestimated the difficulty of such an important skill, and the ability of all those who use ASL to communicate every day. After the first week, I decided to see just how far I could progress myself, without setting a goal for the end of the semester so that I could learn at my own pace, and not pressure myself to learn too much too quickly. The first website I tried to use for learning ASL was lifeprint.com, which features the American Sign Language University. I didn’t really like the layout of the website or the order of the lessons, so before I ever used it for a lesson, I found two new resources: ASL THAT and signlanguage101.com. 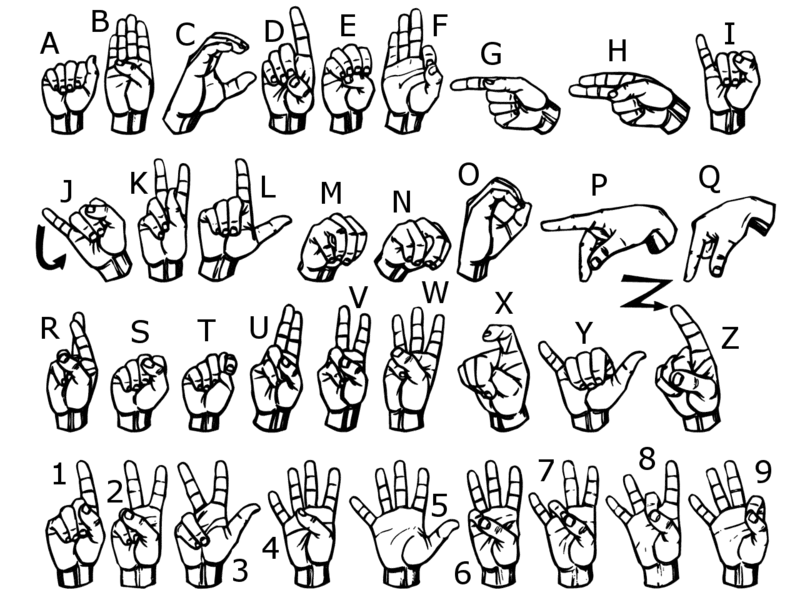 I really liked ASL THAT because of the simplicity of the videos, such as the video I used to learn the Alphabet. What I liked a lot about the signlanguage101.com videos, were that they were full, comprehensive lessons, and the teacher always included language tips and tips about deaf culture, so that you weren’t just learning basic ASL, but learning how and why certain rules existed, such as in this video I used to learn gestures. As I continued on, I started to branch out and find more resources, such as Signing Savvy, an online English-ASL dictionary, and Sign Language Blitz. I also found great videos from the South Dakota School for the Deaf’s YouTube Channel, such as this one, that I used to learn adjectives. Finally, the last resource I found is the one I wish I had found first, Rochelle Barlow’s website and YouTube Channel, which featured lessons from beginner to expert, and downloadable worksheets that help learners keep track of progress at home. What I liked about the use of technology for this project was the fact that I was able to use many different resources of my choosing, and choose lessons that I felt that I wanted to do. I was able to skip any lessons I wanted, and learn any lessons I wanted. This helps make learning more personal and tailored for learners. I also loved being able to film myself each week and watch myself as I progressed. When I got bored, I could simply look around on Twitter and other online spaces to find new resources to use. Pronouns: he, she, them, they, it, you, me, they, we, my, you, your, ours, myself, yourself, themselves, ourselves, someone, each other and other. Verbs: Eat, drink, jump, walk, run, sit, stand, sleep, sleep, fly, fly, cry, wake up, stop, pick up, push, pull, open, close, wash, kiss, throw, drop, hit, hit, cut, fall, hug, drive, turn around, kick, pour, pour. Adjectives: Hot, cold, big, little, happy, sad, clean, dirty, broken, red, blue, green, yellow, orange, purple, black, white, pink, brown, one, two, three, yucky, silly, soft, fast. They say that you are fluent in a language once you have one thousand words in your vocabulary, and while I’m quite far off, I can see it becoming a real possibility as I continue to study ASL. Is it as much as I would have liked to learn? No, but I’m just getting started, and I enjoy being able to go at my own pace. I can’t wait to continue learning ASL, and keeping my blog and Twitter up to date on my progress. Thanks for joining me on this learning journey! This week to finish off my learning project, I decided to learn some more basic, but important words in American Sign Language: numbers and animals! I had already learned some of the numbers in previous weeks, but I really wanted to solidify my knowledge of numbers up to 30. I went back to the first YouTube video channel I tried, ASL THAT. One thing that I wasn’t crazy about when following along with this video was that it didn’t display the numbers in on the screen, or say them out loud so it would have been difficult for someone who needs to pause the video to follow along. After this, I decided for my final lesson that I would learn the signs for different animals. I decided to use another “First 100” video from the South Dakota School for the Deaf, “First 100 Animals”. I really liked that each sign seemed to just focus on a characteristic of the animal (except for dog), which made the signs really easy to remember! I really enjoyed the entire process of learning ASL, and will definitely keep working on it! Stay tuned for one more learning project post: the wrap up post, and follow me on Twitter to stay updated about what I’m learning next! A good language tip that I learned from this video is that when you’re fingerspelling, it really doesn’t matter which hand you use! From here, I moved on to the South Dakota School for the Deaf’s “100 Adjectives” video. What was nice about this video was that I already knew some of the signs! I remembered learning the colours just a few weeks back, so this video really helped solidify that knowledge. I also watched this video that I saw in the YouTube sidebar titled “Sign Language Sentences- The Basic Structure”. The video is by Rochelle Barlow, who I found out also has her own website and program for learning ASL. Rochelle’s video was really insightful and helpful! Even though I’m still a beginner, these tips will really help me as I progress even after the Learning Project is done. She has a lot of other videos and resources, and even has a link in the description of this video to a page on her website where you can download worksheets. I decided to try it out, and it asked for my e-mail address and first name so that the worksheets could be sent to me via e-mail. I downloaded the worksheets, and honestly I wasn’t expecting much. Rochelle features a lot of free content on her website but I know that a lot of her content has to be paid for, so I was a bit worried that the free worksheets would’t be that great — but boy was I wrong. I’m a sucker for pink. I’m also a sucker for beautiful fonts, so these worksheets had it all for me. They are easy to follow, provide examples, a recap of what was learned and answers. They are printable as well, making things just that much easier. Rochelle’s website and YouTube Channel are resources that are absolutely amazing for people learning ASL, from beginners to experts. I really like her teaching style, as well as the range of content available. I only wish I had found it sooner. Join me next week as I wrap up with some fun stuff: numbers and animals, and don’t forget to follow me on Twitter. This week, I continued my ASL learning project by moving onto lessons #2 and #3 from signlanguage101.com. These lessons included the alphabet, colours, pronouns, and basic phrases. I began with Lesson #2: Colours and Pronouns. This video also included the alphabet, but since I had already learned this last week, I skipped over it straight to colours. The colours that I learned were red, blue, yellow, white, black, green, orange, pink, purple, tan, brown and grey in that order. Purple was the trickiest to learn and reminded me of the letter “K”. After colours, the video moved onto numbers over eleven, which I followed along with and practiced. Then came pronouns. I found out that when saying he, she, them, they or it, using the index finger to point is perfectly acceptable. The rest of the pronouns that I learned signs for were you, me, they, we, my, you, your, ours, myself, yourself, themselves, ourselves, someone, each other and other. After this video, I moved onto the next one, which was #3: Everyday Signs and Phrases. I practiced the phrases along with the video, and decided to share my own progress with a video next week when I’ve mastered them a bit more! Something that I really enjoy about the Sign Language 101 videos are that Dr. Bridges doesn’t just provide a vocabulary list, he also talks about deaf culture, and provides a full, rounded lesson in each video. Besides what’s in the title, each lesson also includes a list of numbers, so the learning of new numbers is ongoing. Join me here next week to see my progress as I move onto lesson #4, Antonyms and Common Phrases, or follow me on Twitter to see my progress @ms_kday. To begin my learning journey with ASL, I thought it was best to start with the basics: the alphabet! The ASL alphabet has a specific sign for each of the letters found in the English alphabet, and many of the signs look similar to how we would write them in English. For example, W is a “w” shape made with the fingers, so is C, L and O. To begin learning the alphabet, I decided it would be easier to watch someone else do it. The website I had chosen to follow along with (lifeprint.com) did not have the alphabet available in video form, so I went to trusty old YouTube, and typed “ASL Alphabet” into the search bar. The very first video that popped up turned out to be the one I liked the best, because I thought it was good pace to follow along to. I practiced along with the video for awhile, and found that the more difficult letters for me were G, P and K. After awhile though, I started to feel pretty confident! After I felt pretty confident with the alphabet, I returned to lifeprint.com to begin lesson #1. However, I realized pretty quickly that I disliked their layout, and the vocabulary lists seemed to be random and illogical. So, I decided to switch resources, and went back to Google to find a new website to use. I typed in “learn ASL online”, and a I picked through a few before settling on http://www.signlanguage101.com, because it is extremely user-friendly, uses videos for its lessons, and the videos are in an order which makes sense for users when trying to effectively learn the language. I decided to start with Lesson #1: “Gestures and Body Language”. What I really liked about Lesson #1 was the way that the instructor speaks to the learner, and begins with gestures that are probably already known to the learner, making them feel more at ease and capable of completing the task. The instructor was easy to follow and went at a good pace, and introduced a good base set of vocabulary words, including ones that are probably already known to the learner. This coming week I will attempt to complete lessons two and three, which are “ABC’s, Colors & Pronouns” and “Everyday Signs and Common Phrases”. Continue with me on my learning journey here on my blog, or by following me on Twitter @ms_kday. For my learning project, I have decided to learn American Sign Language. I decided to choose this for my project because I feel like it is a useful skill to have, especially in the classroom, and it is something that I have always wanted to learn. Right now, I only remember a little bit of the alphabet from when I was taught when I was younger. For this project, I will be using the website lifeprint.com, which features what’s called the “ASLU” — American Sign Language University. Within this site there are lessons and units which range in difficulty and are sequential. The lessons feature videos, as well as clear objectives and targets for each lesson. I plan on following these lessons while adding and taking out what I feel is necessary. For example, the first lesson doesn’t teach the alphabet, but I want to learn the alphabet first before I continue. I hope to reach at least the 15th lesson by the end of the term. I’m really glad to have found this resource, which will allow me to keep track of my progress, and which I could use in a future lesson plan. I’m really excited to get started on the project and see just how proficient I can be in ASL by the end of the term!